This Lizard is usually six Inches long, of a shining grass green Colour. It is common in Jamaica, frequenting Hedges and Trees, but are not seen in Houses that I observed. When they are approach'd to, they by filling their Throat with Wind swell it into a globular Form, and a scarlet Colour, which when contracted the red disappears, and returns to the Colour of the rest of the Body. This swelling Action seems to proceed from menacing, or deterring one from coming near him, tho' they are inoffensive. 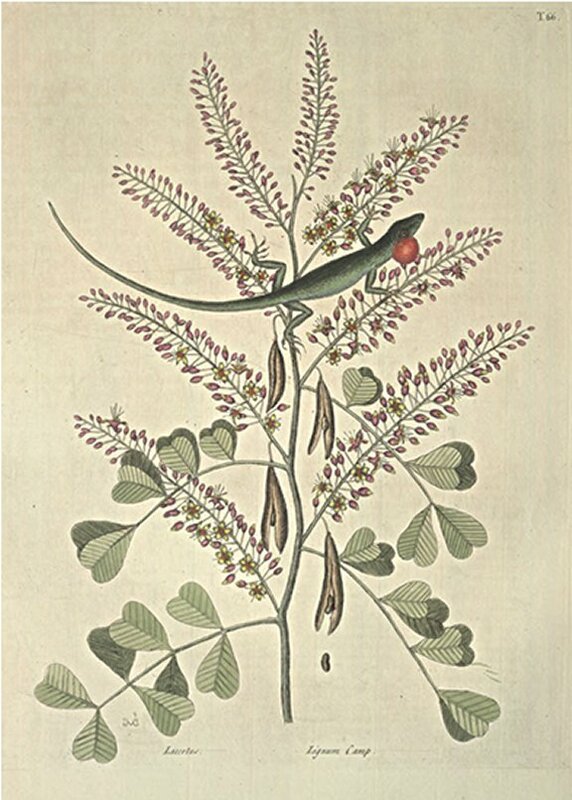 In the Year 1725, I saw three of these Trees in the Island of Providence, which were raised from Seeds brought from the Bay of Honduras, by Mr. Spatches, a Person of more than common Curiosity. He told me they were of three Years Growth, from the Seed, they were then about fourteen Feet high; their Truncs strait, and about seven or eight Inches thick; their Heads branching regularly, and being in full Blossom, made a beautiful Appearance. The Leaves are pinnated, consisting of four, and some five Pair of Lobes, set opposite to each other, and are in Shape of an Heart: From the Tops of the Branches shoot forth many Spikes of small pentapetalous yellow Flowers, every one of which before it opens, is covered with a purple Calyx. The Flowers are succeeded by final! flat Pods, about two inches long, which when ripe split open in the middle, and disclose five or six small flat Seeds. The bloody Disputes which this useful Tree has occasioned between the Spaniards and English are too well known to say much of here, only I could wish that the Inhabitants of our Southern Plantations could be induced to propagate it, as well for their own Advantage, as that we may be supplied by them, when wholly deprived of getting it from the Spaniards, as we have hitherto done either by Force or Stealth. If upon a Rock these Trees will in four Years bear Seeds, and grow to the Thickness of eight Inches, a much quicker Progress may be expected when planted in a deep moist Soil, which Jamaica and many other of our Islands abound in.